My friend Sarah recommended a fascinating book called Food As Medicine by Dharma Singh Khalsa, in which he recommends mung beans and rice as an easily digestible, healing staple you can "fall back on when you need to regain balance in your life." He suggests eating it at least once a week for general good health and especially after fasting. I feature it now as a good cleansing recipe in honour of the Autumn Equinox this coming weekend! Wash and chop vegetables (I used 1 cup each zucchini, carrot, peas and cabbage). Add to simmering rice and beans along with the ghee and continue to cook for 15 more minutes. Meanwhile, heat oil in a large frying pan and add onions, ginger and garlic. Saute for until brown and then add turmeric, pepper, garam masala and red chilies*. Stir this mixture into the pot of beans and rice. Add sweet basil, cardamom seeds, and sea salt or Braggs. Continue simmering another 10-15 minutes, stirring often. If needed, add more boiling water until rice and vegetables are completely cooked. The consistency should be rich, thick and soupy. Serve with a dollop of yogurt if you like, a drizzle of flax oil, or a sprinkling of pine nuts. For some zingy fresh greens, Vatas and Kaphas can top with a spoonful of my green salsa or just fresh chopped parsley/cilantro. Makes 4 servings. *Omit onions, garlic and chilis if following a sattvic way of eating or if following a fast or illness. 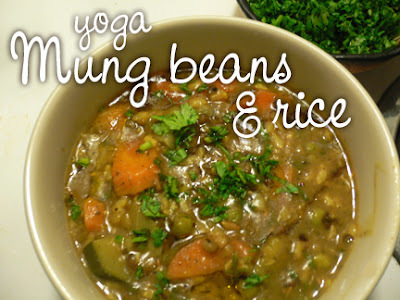 I call this "Yoga" Mung Beans & Rice because in his book, Dr. Khalsa refers to this kind of eating "Yoga Nutritional Therapy", which is simply a modern term for Ayurvedic nutrition. According to YNT, three major health foods are almonds (nuts and oil), beets (vegetables and greens), and basmati rice. Ghee is also noted as a healing ingredient. This particular type of dish -- a healing soupy stew of rice and mung beans -- is also called a kichadi. NOTE: If serving to the sick, elderly, or children, make it less spicy. A healing stew for all doshas. This is one of the very best and delicious soups/stews I have ever tasted. I made it and my husband couldn't get over it!!!!! I have this on the stove right now....can't wait to eat it! Can you tell me how long it will keep in the refrigerator? Ayurvedically, food should not be kept in the refrigerator to be eaten later, it is most healthful to eat food cooked fresh. But, with life the way it is as we rarely have time to cook fresh each meal each day, we do what we can! Eat this meal the next day, or at most 2 days later -- I would not keep it longer than 2 days. Hope this helps! Thank you Claudia. I'm new to Ayurvedic cooking, I think I need to do a little reading on it to better educate myself. The stew is DELICIOUS and my body loves it!!!!!! I really appreciate your quick response.